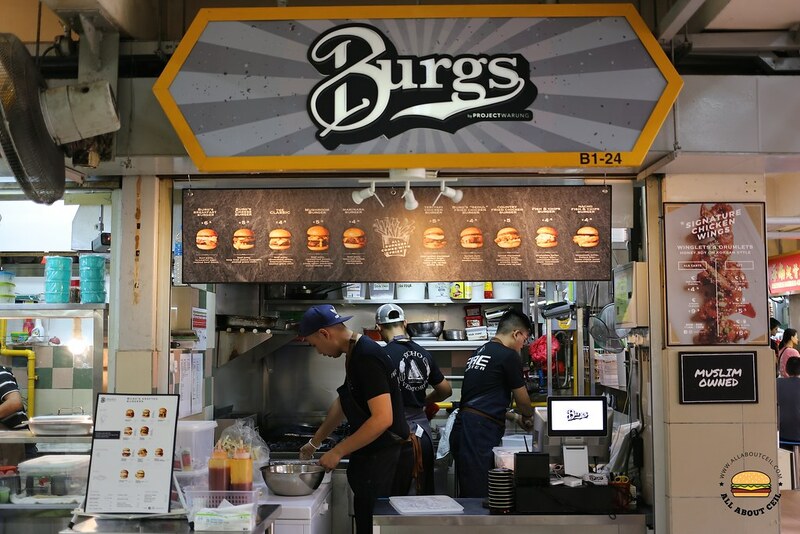 BURGS is by Project Warung Pte Ltd, a Muslim-owned company created by Ridz Uan, Lee Syafiq and M Shah Indra, the 3 young chefs who want to change the halal culinary scene in Singapore. This is their first outlet located in the basement of Golden Mile Food Centre, it has just opened about a week ago on 13 May 2017. 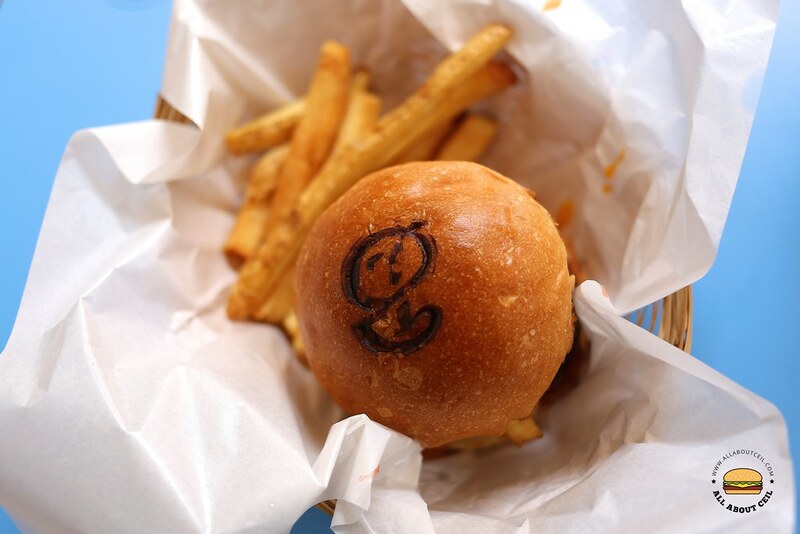 They aim to serve quality gourmet burgers at affordable prices to accommodate the growing needs of quality halal burgers. When I was there, the shutter was down with a notice on it to inform of their adjusted opening hours as they were away for their Friday prayer. I was happy to see their shutter up after 2 pm and I was told apologetically that they will only be ready at 2.30 pm and they even further explained that they went for their prayer earlier. I went back at 2.30 pm to place my orders. There are quite a few choices on their menu. 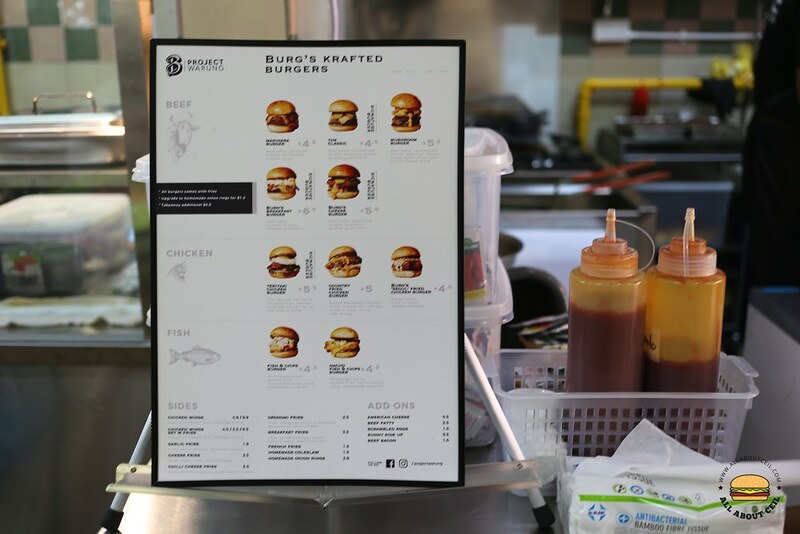 For beef burgers, there are the Marinara Burger ($4.90), The Classic ($4.50), Mushroom Burger ($5.50), Burg's Breakfast Burger ($6.50) and Burg's Cheese Burger ($5.90). 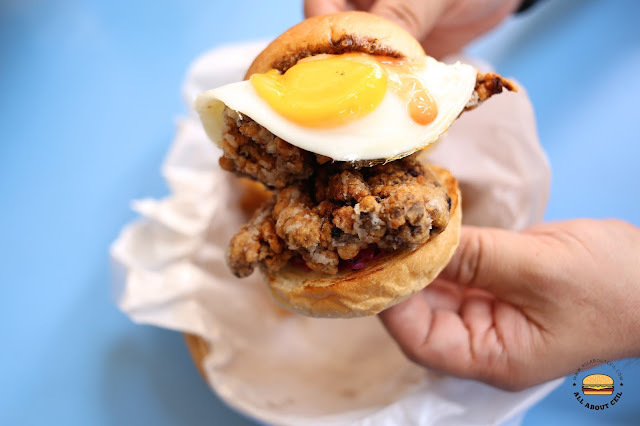 If you prefer the chicken burger, there are Teriyaki Chicken Burger ($5.50), Country Fried Chicken Burger ($5.00) and Burg's 'Seoul' Fried Chicken Burger ($4.50). There are also choices for the fish burger which includes Fish & Chips Burger ($4.50) and Nacho Fish & Chips Burger ($4.90). 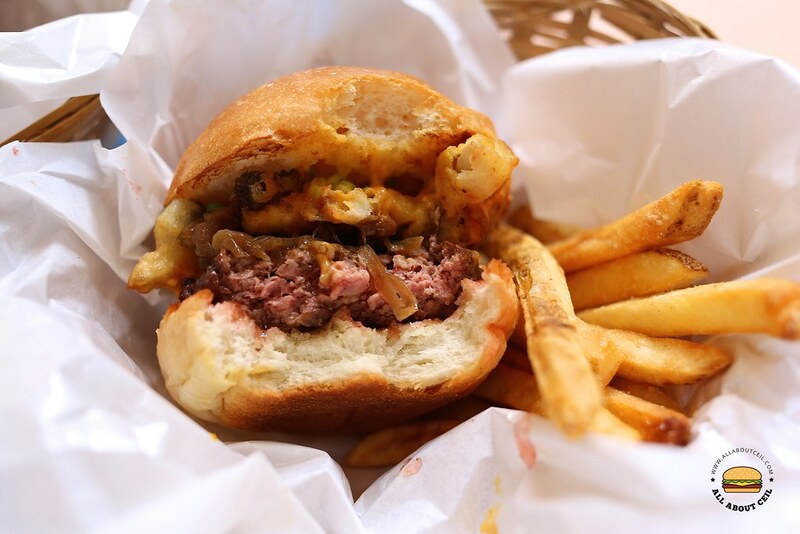 All the burgers are served with fries or upgrade to onion rings for an additional $1.00. There are also options for sides and add-ons on their menu. I went with Mushroom Burger ($5.50) and Country Fried Chicken Burger ($5.00). I wanted to change the fries to onion rings but I was told that it would not be available for the rest of the month as they could not get those quality onions for onion rings. Then, I was asked, "Do you want any side to go along?" I decided to get half a dozen of fried chicken wings for $4.90. I asked for a recommendation when come to choosing the flavour. Lee Syafiq that took my order, said, "I will recommend Honey Soy flavour for the fried chicken wings." The other option is the Korean style. I paid a total of $15.40 and was given a pager to collect the food later. When I was taking the picture of their menu, I was asked by M Shah Indra, "How did you get to find out about us?" I replied, "The stalls that I wanted to eat happened to be closed, I was just walking around and spotted your stall. I actually waited for your stall to open." When collecting the food, I asked, "You buns look special. Do you custom made them?" Ridz Uan answered, "They are from an artisan bakery." They actually have their logo printed on those buns. They mentioned on their Facebook page that only the best ingredients are used for their burgers. 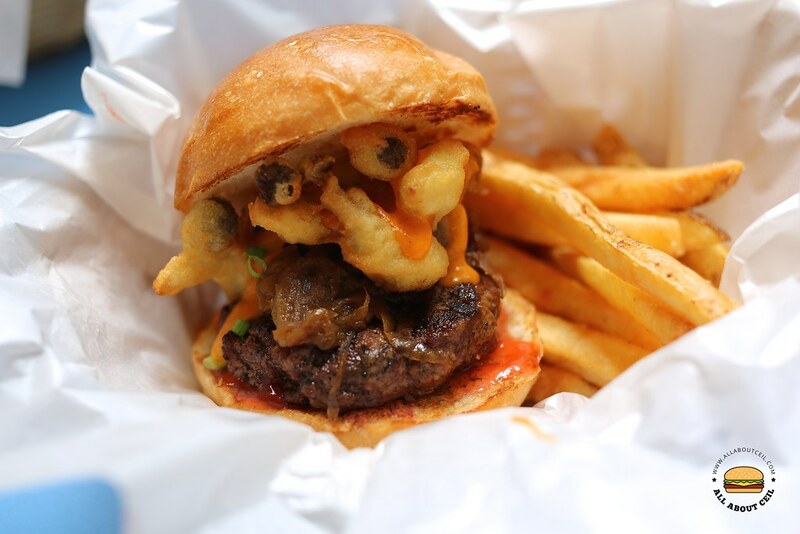 The Mushroom Burger ($5.50) consists of an American cheese topped beef patty that was well-grilled to medium doneness and served on the artisan buns. It was garnished with a handful of caramelised onions together with a pile of crispy oyster mushroom that added a textural contrast and with nacho cheese sauce. The unique combination is a classic on its own. It was served with a good portion of hand-cut fries. 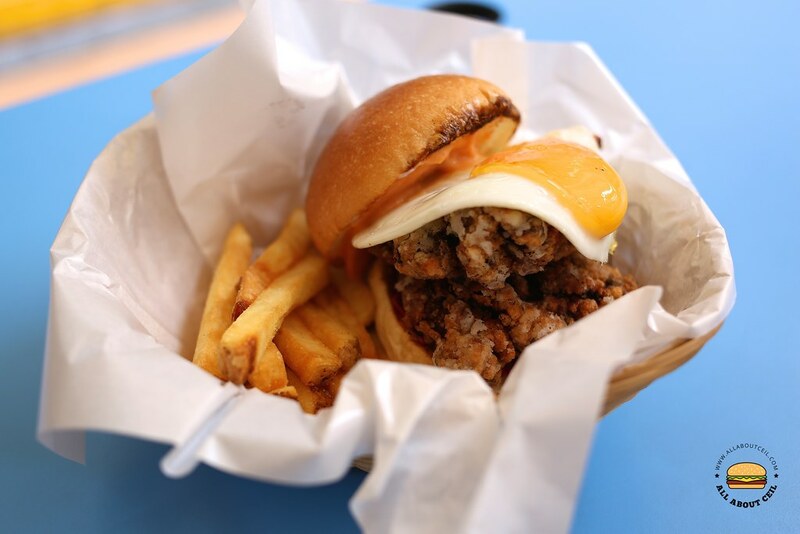 The Country Fried Chicken Burger ($5.00) consists of spiced marinated chicken thigh, homemade coleslaw, a sunny-side-up egg and Sriracha Mayo. The fried chicken was nicely fried to the desired crispiness, though a slightly saltish but the homemade coleslaw brought upon a refreshing twist. The texture was further enhanced by the runny egg yolk and it has a slight hint of spiciness from the Sriracha Mayo. And, with the aforementioned ingredients as its toppings, it is one of their special burgers that is not available elsewhere. 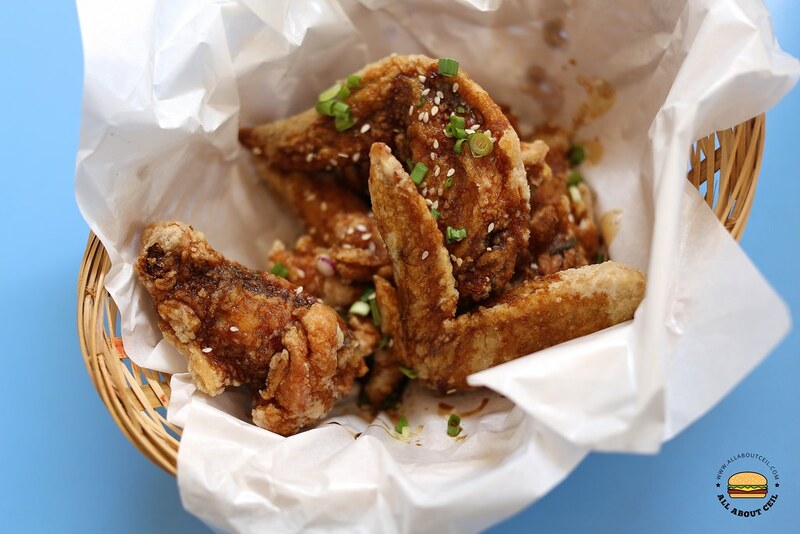 The half a dozen of Honey Soy Fried Chicken Wings ($4.90) was served slightly drizzled with the honey soy sauce then garnished with sesame seeds and chopped spring onions. Those parts that did not coat with the sauce was slightly bland as the chicken itself did not have much flavour. It was nicely fried and it still crispy even after leaving it for a while. Lee Syafiq came over to ask, "How was the food?". I said, "I prefer the Mushroom Burger more and the buns are really nice." My dining companion commented, "The fried chicken for the Country Fried Chicken Burger was slightly saltish." He acknowledged and replied, "The chicken patty might be slightly over marinated for today." He handed a copy of their name card and said, "Do check out our Facebook and Instagram." And, right here, you are getting much better quality burgers at about the same prices with those burgers that are available at the fast food joints. So, which is a better choice? You choose.